Solar radiation reaching the Earth could be harnessed through the heat it produces, as well as through the absorption of radiation, eg optical or otherwise. Green energy is not always so cheap but at and getting better electricity rates. 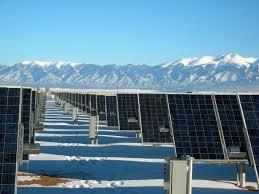 It is a so-called renewable energies, particularly the non-pollutant, known as green energy or clean energy. The power of radiation varies according to time of day, weather conditions that soften and latitude. It can be assumed that good irradiation value is approximately 1000 W / m at the surface. This power is known as irradiance. Radiation is usable in direct and diffuse components, or the sum of both. Direct radiation is coming directly from the solar source, without intermediate reflections or refractions. The diffuse is issued by the daytime sky with the phenomenon of multiple reflection and refraction in the solar atmosphere, clouds and other atmospheric and terrestrial elements. Direct radiation can be reflected and concentrated on its use, while it is not possible to concentrate the diffused light coming from all directions. The direct normal irradiance (or perpendicular to the sun) outside the atmosphere, called the solar constant and has an average value of 1354 W / m (this corresponds to a maximum value at the perihelion of 1395 W / m and a minimum value at aphelion 1308 W / m ). According to reports from Greenpeace, the PV can provide electricity to two thirds of the world population in 2030.